View all products by Salome Naturals Inc. 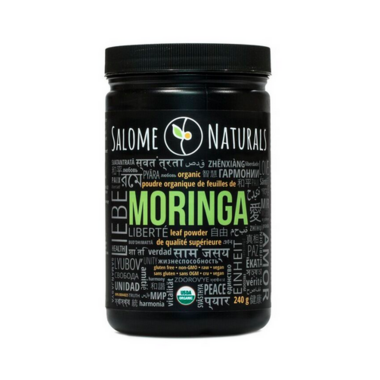 Designed by Mother Nature, Salome Naturals' premium raw organic Moringa Oleifera contains a nutrient profile, unlike any other plant source. Rich in vitamins, minerals, and essential fatty acids, Moringa contains 46 anti-oxidants and 36 anti-inflammatory compounds that your body will absorb and synthesize with unparalleled efficiency. To top it off Moringa is a complete protein. Feed your body, mind, and spirit the abundance you deserve! To help lower total cholesterol and support healthy glucose levels: Take 1 scoop (2g) with a cup (250ml) of water or your beverage of choice, or add to your favourite shake or smoothie 4 times per day. As a source of antioxidants: Take 1 scoop (2g) with a cup (250ml) of water or beverage of choice, or add to your favourite shake or smoothie 1-2 times per day.